In December I completed a course to become a Mental Health First Aider. Here are some thoughts on the course, and why businesses of all sizes should strongly consider having a Mental Health First Aider within their organisation. 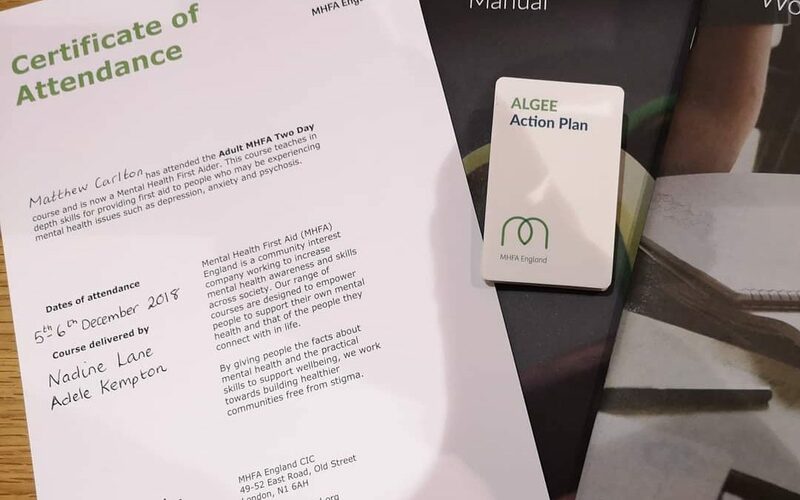 With an increasing number of clients and prospects asking me about mental health in the workplace, attending a Mental Health First Aid training course had been on my to-do list during 2018. Finding two consecutive clear days can be tricky for anyone with a busy role, so once a course is booked, keep these days free of any other business. This is imperative as this is an intense course. A lot is covered in those two days and given the sensitive topic being discussed, staying switched on is important – avoid email distractions. The morning session on day one covered a number of topics including stigma and discrimination, symptoms of depression, risk factors for depression, and depression in the workplace. Prior to this, attendee introductions were given, setting the tone for the sharing, teamwork and interaction which was incorporated into the learning. Some attendees shared their experiences of suffering from mental health problems or supporting those with mental health ill health. Such accounts, while upsetting to hear on occasions, made the course seem even more worthwhile – that this knowledge and training could one day make a difference to someone going through a hard time. Arguably the heaviest subject of all – suicide – was covered in the afternoon of the first day. This included First aid for suicidal crisis and vital non-judgemental listening skills. Thankfully our course leaders delivered the content in an engaging manner, allocating plenty of time for breaks and reflection to allow us to absorb learnings before moving on to a new area. I also feel more confident advising businesses as to whether they should send a staff member on the training, so they can have a designated Mental Health First Aider in their workplace. Even in a small team, having someone to offer support to those in need – and to know what to do in a crisis – can be crucial. It should also help foster a more understanding workplace where there’s less (or no) stigma around mental health problems. That said, There is no silver bullet when it comes to workplace mental health and having a designated Mental Health First Aider should be just one part of the wider approach covering mental health and wellbeing. And for businesses looking for more information on Mental Health First Aid, a recent study on its effectiveness in the workplace (carried out by IOSH) is a good read. You can access a summary report here. For more information about the course, contact me or alternatively visit the Mental Health England First Aid website.